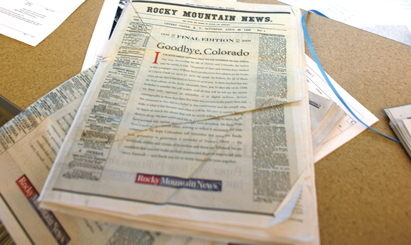 The February 27 final edition of the Rocky Mountain News was a clear message that many print publications will follow the newspaper into extinction if they do not drastically alter their business models. And it is a reality for which PR pros have long been preparing. Though the folding of an established local newspaper eliminates opportunities for PR agencies in that area, those firms are adept at pitching blogs and news Web sites and working on social networking efforts, explains Jeff Julin, president of Denver-based MGA Communications. Yet there are many aspects of the Rocky Mountain News' print-focused daily journalism that agencies will miss. Julin, for his part, explains that newspapers have a natural credibility as local authorities that bloggers are still working to build. He adds that firms will feel the loss of newspapers' editorial pages, and the viewpoints they project upon communities, businesses, and public servants. Denver agencies, of course, are not alone in their anxiety about losing a major media outlet. Recently, Hearst disclosed that it will put the San Francisco Chronicle up for sale or close it unless it can achieve sharp expense cuts. The publisher also said that it could shutter the Seattle Post-Intelligencer, or make it Web-only, unless it finds a buyer. Meanwhile, Gannett has threatened to close the Tucson Citizen if a buyer isn't found, and newspaper owners in Philadelphia, Chicago, and Minneapolis-St. Paul have filed for Chapter 11 bankruptcy protection. Louis Richmond, CEO of Seattle-based Richmond Public Relations, agrees that most communications professionals won't miss a beat in turning to non-traditional sources, which are now preferred by many clients. However, he concurs with Julin that bloggers have not yet achieved the good standing of newspapers. In tech-centric northern California, many companies and agencies have grown accustomed to targeting niche Web sites and blogs, where they can utilize video and interactive features for breaking product announcements and day-to-day business news, says Alice Chan, GM of Red Consultancy's San Francisco office. However, if Bay Area newspapers are closed or if they discontinue their business coverage, companies will miss the in-depth corporate leadership profiles that appear most often in newspapers, she adds. Bell Pottinger saga sparks calls for global code of ethics - but are these realistic?